Maple Glazed Carrots are a must for this year’s Thanksgiving table. They are lightly sweetened and perfectly balanced to complement a savory main dish. 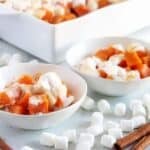 Maple glazed carrots. They might just be the easiest side dish on the holiday menu. If you follow us, you know we don’t really have a lot of Thanksgiving recipes. We have a few solid choices, like our Thanksgiving Leftover Sliders, candied sweet potatoes, and sage stuffing. Every year a couple more get added to the list. 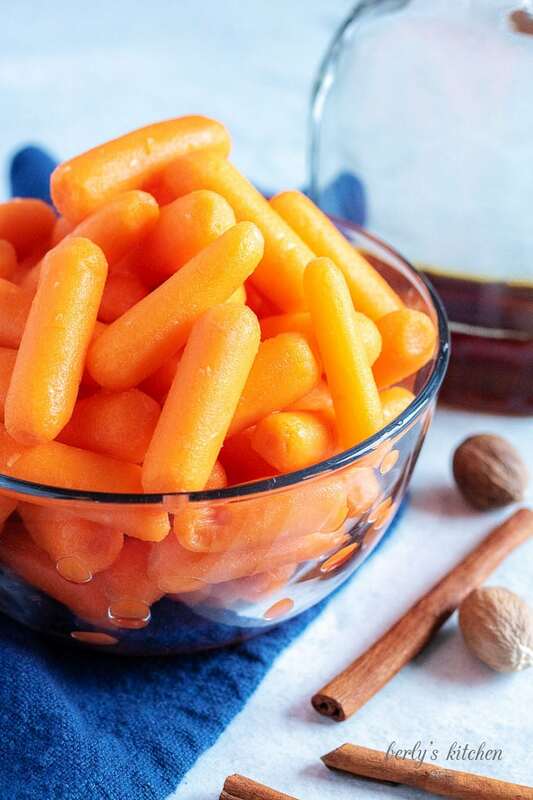 Last year we added these glazed carrots made from large carrots cut into coin-sized pieces, drizzled with sweet maple syrup, and roasted until they become fork tender. This recipe is incredibly easy and flavorful. It will become an everyday favorite instead of making a once a year appearance. 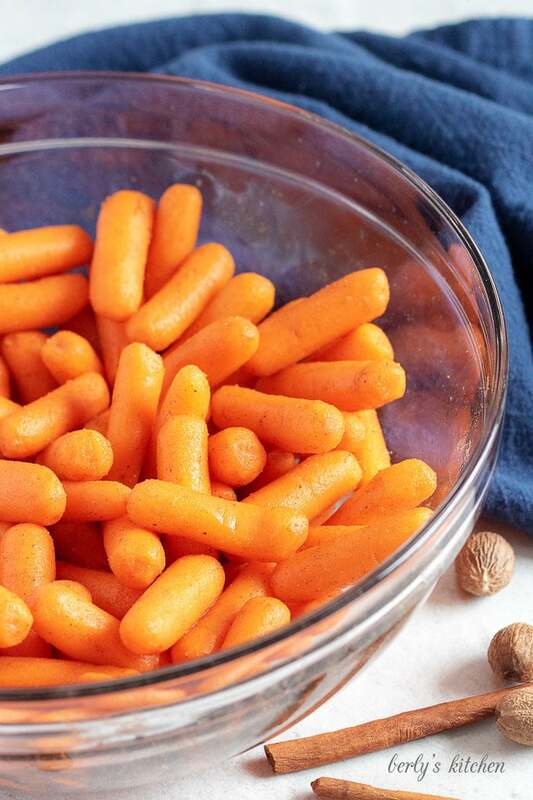 If you’ve never had glazed carrots, give them a shot. Whether you try them with maple syrup, honey, or brown sugar, you’ll be happy you did. Prep time is minimal and you can easily toss everything together in one bowl. You’ll see what I mean in the instructions. 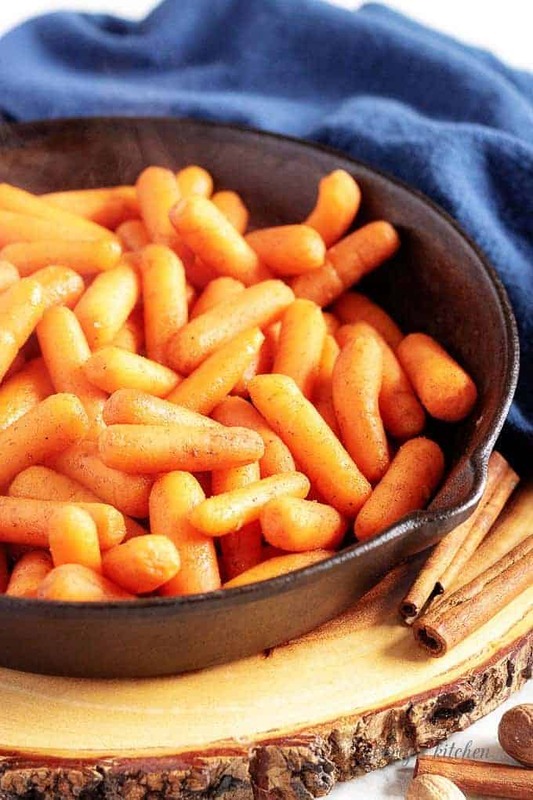 Additionally, cooking roasted carrots in a cast iron skillet adds a rustic appearance to the presentation. Start by preheating the oven and washing the carrots. This time was chose baby carrots instead of whole, large carrots, but either style works. Choose your favorite spices and your favorite brand of maple syrup. We like cinnamon, nutmeg, and ginger with a touch of salt. However, feel free to mix and match the flavors you like best. Then, toss all the ingredients in a mixing bowl. 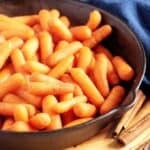 Use a spoon to coat the carrots and transfer the mixture to an 10 inch cast iron skillet. Cover the ingredients with aluminum foil and bake everything for 30 to 35 minutes. Check to see if the carrots are fork tender. Remove them from the oven and serve them hot. It doesn’t get much easier than that! 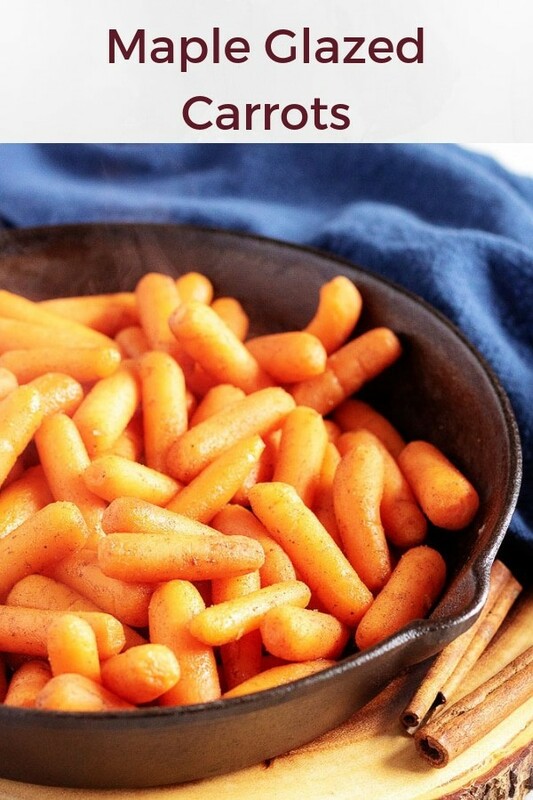 These maple glazed carrots make a quick and easy side dish. We hope that you’ll them a try this holiday season and let us know what you think! Maple Glazed Carrots are a must for this year's Thanksgiving table. They are lightly sweetened and perfectly balanced to complement a savory main dish. Then, in a large bowl, toss the carrots with all the spices, salt, vanilla, and maple syrup. 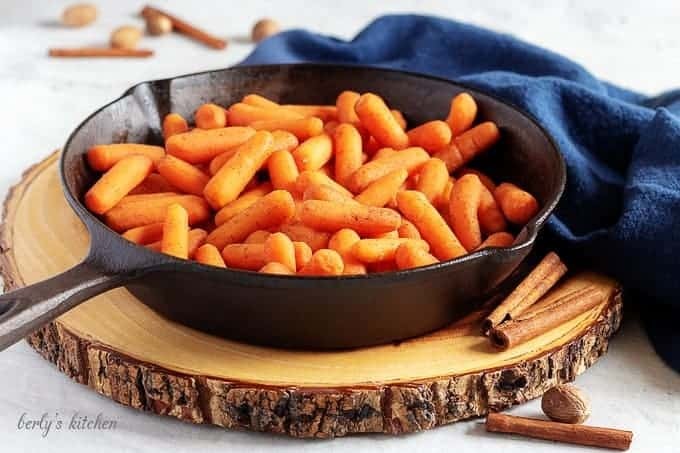 Next, transfer the mixture to an 10-inch cast iron skillet, cover it with aluminum foil, and bake dish in your oven for 35 to 40 minutes or until the carrots are fork tender. Last, serve the roasted carrots while they are still hot. The calories listed are an approximation based on the ingredients and a 1/2 cup serving size. Actual calories may vary. The dish can be stored in a sealed container in your fridge for up to two days. Serve while hot.